EDITORIAL NOTE: The Rosener Equation was valid at the time of recording but has been updated over time. To learn how to properly value domain names in the current market, watch our SherpaReview shows and follow Rosener’s company blog. One of the most popular interviews on DomainSherpa is with domain name broker Andrew Rosener, founder and CEO of Media Options Inc. In that video interview, Rosener walks the audience through the equation he has developed to determine the end user value for premium generic .com domain names. In this context, premium is defined as having an exact match local monthly search volume of greater than 1,000. This article summarizes “the Rosener equation” – including information from many commenters – as well as provides an update on variables used within the equation since the interview took place in May 2011. To fully understand all the subtle nuances, watch the hour-long in-depth interview with Andrew Rosener and the revisit 15 months later (starting at 47:13). The Rosener equation determines the value of a premium generic .com domain name by approximating the value – for a given keyword or keyword phrase – of ranking in the No. 1 organic position of Google. The domain name has a .com TLD. The sale is to an end user, not another domain investor. Having the exact match domain name provides an advantage when being ranked in search results for your main keyword. Matt Cutts, head of Google’s Webspam team, supports this assumption. Google data is used as a representative data set for the global search volume and advertising cost around the world. The basis for this assumption is that Google currently owns a 67 percent market share. Google-provided data is as up-to-date as possible with respect to search volume and advertising costs. There are other better sources, but Google data is likely good enough and the cost is free. The estimated click-through rate of the No. 1 position in Google’s organic search results for any keyword or keyword phrase search is 35 percent, 20 percent for the No. 2 position. Supporing sources include Optify, Free SEO News, CNN, Search Engine Watch and SEO Researcher. A new study by Slingshot SEO released on July 28, 2011, and entitled “Mission ImposSERPble: Establishing Google Click-Through Rates” estimates the click-through rate of the No. 1 position to be even lower: 18.2%. The equation, shown below, uses four inputs to calculate the domain name valuation. Let’s apply the Rosener equation to some domain names that have recently sold. The input data comes from the Google AdWords Keyword Tool (GAKT) on July 14, 2011, as shown in the table below. Calculating the value of a domain name is not an exact science. External influences may vary over time, impacting domain name valuations. For example, search algorithms are constantly changing. Also, with seasonal holiday shifts and the addition of new search techniques (social media referrals, local results, product ads, category results, etc. ), organic listings may continue to be pushed down the page. Domainers generally pay about 75 percent to 90 percent less than what an end user might pay for the same domain. TLDs other than .com will likely only have about 10 percent of the value determined by the Rosener equation. Visit Google, type in the keyword or keyword phrase and see if there are any advertisements displayed. What you see here and the CPC data gathered from the GAKT (to use in the calculation) should coincide. If not, the GAKT data could be outdated or seasonally influenced. Follow a domain name broker on Twitter (e.g., Rosener, Colby). Build a relationship with them (e.g., comment on their tweets, initiate email correspondence, etc.). When the time comes, ask them for advice and a second opinion. If you think that the estimated click-through rate of the No. 1 position on Google should be higher than 35 percent, then adjust the input accordingly. If you think the buyer will be focused on a payback period longer than 12 months, then adjust the input accordingly. The Rosener Equation is generous to give non-.com domains any valuation whatsoever, albeit minimal. To me, they are a liability and you would need to pay me to take one off your hands. How can you find an end user for a domain that is valuable but you have no expertise at building a web site? There are quite a few interviews on how to sell domain names that deal with finding end users. Once you get through those, please let me know if you have more specific questions. I state it is valuable but that is just when I use Mr. Rosener formula. It is in the marijuana industry so that should help. 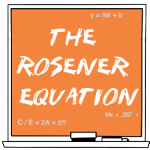 Michael – Can you comment on the Global Search Volume used in the Rosener Equation. As of Oct 2013 one needs to use Google Adword Tools and the Search Volume is either “Google Search Volume” or “Google and partners” Search Volume but this is not “Global Search Volume.” One could look at http://gs.statcounter.com/ which shows current browser usage and try to apply percentages, but what do you recommend as of Oct 2013 to determine an reasonable estimate of true “Global Search Volume” for an Exact Match Keyword? Thank you. Just completed listening to this great interview. Andrews equation is not an exact science because any business itself is not an exact science. From my view, I see his equation more appropriate and direct when it comes to determining the value of a domain name. It’s a two years old interview and I hope Michael will again associate with Andrew to answer how this equation may works at this time when New gTLDs are getting per-registered. The original interview with Andrew was awesome. The article is even a step up because I can skim and use it as a bookmarked reference. Regarding RunningShoes.com, the real value for that domain is ranking for long tail. Running shoes + womens, mens, kids, trail, best and then every manufacturers name and model. New Balance Shoes, New Balance 790 Running Shoes etc. The long tail is where the value is. Some domains have a very long tail : ) Others don’t. But it should not be discounted. It will be easier to rank for those long tail terms in the beginning than it will for the KW match. The long tail on Running Shoes is more like 500,000 vs 60,000. I think RunningShoes.com is a $1M domain personally. Considering it had ranking and revenue when sold, it was a major steal @ $700k. FYI: By that same formula Insurance.com is only worth $7.5M. But overall I think this can give you a good base to start. From there you should do your due diligence and get all of the data accounted for. If Google has 67% of the exact searches, shouldn’t that number be increased by 33% for purposes of the equation to account for all exact searches, not just those on Google? Michael, are you planning on doibg the same for other types of domains, like LLL.com’s or brandables? I would love that. Thanks for the fantastic resource you’re providing! Great summary, Michael. Well written and a tremendous resource! I think it should be US traffic since it’s debatable if the world outside the US has the same views about domain names. Where is the bulk of Google’s revenue from? @Adam: In some cases I think the global search volume would be more appropriate and in other cases I think it would be less appropriate. This is the case with the payback period as well, adjust up from 12 months when appropriate. That’s the beauty of Andrew’s equation…it’s conservative and allows you to modify for your own, personal situation because you understand all of the factors and variables, as opposed to some of the other “black box” valuation systems that exist.